Which is the only mammal that can fly? This article will make you familiar with the only mammal that can fly. Q. Which is the only mammal that can fly? Ans. 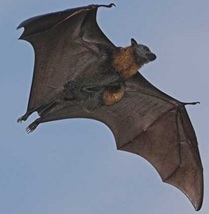 Bats are the only mammals that can fly. Bats do not flap their entire forelimbs as birds do, but instead flap their spread-out digits that act as wings composed of a double membrane stretched over a framework of finger bones. These wings are more delicate and thinner than those of birds. Previous Article Are you aware of the fact that Earth’s rotational speed is slowing down every day? Next Article Dolphins sleep with half of their brain awake and one eye open – isn’t it amazing?